As the realization of the work and endless tasks begins to bear down each spring, the anticipation of a new crop year can quickly turn to anxiety. Juggling the spring workload requires well-thought-out plans and a healthy dose of experience. However, even the most carefully crafted plans can be destroyed by the uncertainty of spring weather. Heavy workloads delayed by weather often mean critical decisions need to be made between spring planting or the timely harvesting of a forage crop. As the practice of double cropping has gained more traction throughout the Upper Midwest, high yielding and quick maturing winter rye has helped boost forage inventories and allowed adequate time for a subsequent crop to be planted and mature. A major drawback is that harvest usually falls during the busy crush of spring workload. Limited experience or poor planning, coupled with hasty decisions and the unpredictability of Midwest weather, means winter rye can frustrate even the best managers. I saw this happen firsthand on a farm I was working with a couple of spring seasons ago. The experience yielded several good lessons to keep in mind about rye, silo bags, and hiring a custom operator. Joe’s farm was by anyone’s standards a well-managed, productive operation with healthy cows and crops that were the envy of his neighbors. To boost on-farm forage inventories, Joe decided to seed 130 acres of winter rye in the fall. It wasn’t the first year the farm had planted winter rye. The initial attempt had been seven years previous. Joe had been satisfied with how the crop had yielded and fed. What hadn’t been satisfying was how the hollow-stemmed forage had packed in the silage pile. Joe’s crop manager commented the rye tended to “flow a bit like water” underneath the pack tractor tires. 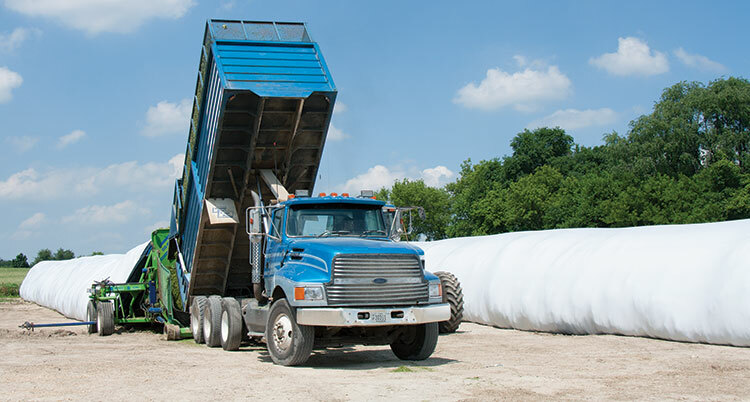 As spring approached, Joe decided to put the ryelage in a silo bag rather than pack it in a silage pile. The farm didn’t have bagging equipment, so a call was made to a well-respected custom bagging operator and scheduled the desired week for harvest. Spring arrived early and fieldwork clicked along. High-quality forage and high-producing cows go together. Timely spring rains and an unusually warm stretch of weather brought first crop alfalfa along quickly. When the opportunity came for an early alfalfa harvest with excellent quality, Joe capitalized and successfully harvested several hundred acres of excellent first crop. The unusually warm weather had also pushed both the yield and maturity of the winter rye. It is often said winter rye can go from prime quality to junk in the space of a day. The rye was maturing quickly and a call was placed to the original custom bagger; unfortunately, he was now committed elsewhere. The farm desperately needed to find a new custom bagger. After several phone calls, one was located, but Joe knew virtually nothing about the operator. The new custom bagger offered assurances that his bagging equipment could handle the farm’s trucks. Joe made the decision to hire the individual without the usual references he had required in the past. The farm crew had pushed hard to get the alfalfa harvested. Cutting the rye immediately would result in harvesting over the Memorial Day weekend. It was decided to let the crew celebrate the holiday with family. That decision proved unfortunate as the next week brought torrential downpours. However, the delay would appear relatively minor compared to the downward spiral of events that followed. The custom operator showed up with bagger in tow. His unkempt appearance coupled with the amount of garbage that rolled out of his truck didn’t do much to ease Joe’s anxiety. The bagging machine came complete with a coating of the previous year’s rotten forage. Despite the custom operator’s insistence that the rotten forage and his machine’s obvious lack of maintenance would not affect how it performed, Joe proceeded to flush the machine clean. As the bagger was being scrubbed, the custom operator commented on how previous clients were impressed with how much feed he could fit in a bag. The rye began to roll in and it became obvious that horsepower was not a limitation. The bag began to expand, but similar to a party balloon, silo bags have limits. It soon became evident that the operator had never experienced filling a bag with ryelage. The bag expanded in girth rather than length, and before filling was complete, the first bag split open. As rebagging commenced, the rye was drying rapidly. By the time the second bag was started, the forage had already fallen below the target moisture range of 62 to 70 percent and was now in the 50s. The race was on to fill the next two bags, and the custom operator continued to stretch the bags’ physical limits. When the final two bags were completed without bursting, the farm crew breathed a sigh of relief, which turned out to be short-lived. The hollow and porous nature of winter rye brings unique challenges. As the unseasonably warm weather continued, the gas spaces within the bag expanded. Despite normal venting, in less than a week the second bag split open followed closely by the third. The custom bagger was called back, and some of the forage was rebagged with Joe’s insistence that the new bag not be overstretched. Unfortunately, the second bag was positioned between bag one and three. Rebagging the partially fermented rye was impossible. After conferring with a couple of the farm’s consultants, it was decided to “wrap” the forage in place utilizing a sheet of oxygen barrier plastic. Tempers flared as the farm workers dug out the sides of the bag to get the plastic down to the ground. Another round of torrential downpours, complete with high winds, did little to cool tempers. Once the plastic was finally secured, a bin fan was used to draw oxygen out of the bag and pull the plastic down tight, allowing fermentation to finish. Surprisingly and likely due to the quick action and hard work of the farm crew, the rye heated very little and spoilage was minimal. Although overly mature, the rye was good enough quality to feed young stock and low-producing cows. Joe acknowledged that his unfamiliarity with bagging winter rye, not anticipating the timing and short-harvest window, and a lack of communication with the original custom bagger were significant oversights. Ultimately, not following farm protocol and checking references on the second custom bagger ended up being a mistake not likely to be repeated. Joe continues to plant and harvest winter rye and a new custom bagger has been hired — this time vetted and with extensive, reliable references. This article appeared in the August/September 2017 issue of Hay & Forage Grower on pages 6 and 7.